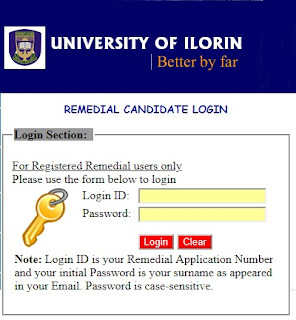 Are you an admission seeker for the University of Ilorin Remedial (Predegree) programme? If yes, be informed that the admission list is now out for applicants to check their status through the remedial portal. Below are the procedures to check yours. Enter your surname (in small letters) as your password. You are to pay the acceptance fee, if lucky to be offered admission. 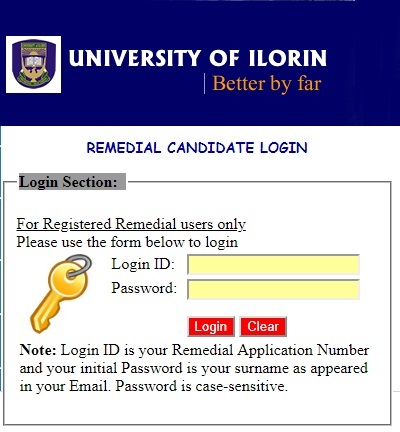 Note that Remedial Application Form Fee is N15,000.00 excluding N150.00 bank charges. Also, application without online payment is not complete. Payment of acceptance fee ends February 28, 2019. You will make the payment online using your ATM card through Remita platform. Take the Attestation with your O’level results, Birth Certificate, and other relevant documents about you to University of Ilorin Re media Centre in FuFu Ilorin Kwara State for screening. After this, you will be instructed to pay the school and accommodation fee. Then, return back to school for lectures. Remember to register for the ongoing JAMB UTME. It is compulsory for all remedial students to register for UTME and take part in the Post UTME exercise of the university.